Last week in my post, A thing or two about Ducks, I mentioned that I would soon blog about some water fowl that look sort of like ducks, and are commonly mistaken for ducks, but are not ducks at all. Now, you can certainly tell that the little creature featured above is NOT a duck at all. But, looks can be deceiving! He is a Florida Marsh Rabbit, whom I saw on a recent evening, just sitting in the water eating reeds – an odd sight! Much to my amazement, soon after I took this picture, he SWAM away! Smaller than the Cotton tail, the Marsh Rabbit is often found near freshwater marshes, and is actually quite a good swimmer. But, he is clearly NOT a duck 😉 . . . They are referring to the plump and lovely Common Moorhen. This Moorhen (also called the Common Gallinule), distinguishable by his bright, red and yellow candy-corn beak with extended frontal shield, is actually a member of the Rail family. Even though he swims in the water with a variety of ducks, he has long, yellow, chicken-like legs and toes rather than webbed feet. Visitors also frequently see this bird swimming about with the Moorhens and ducks and say, “I’ve never seen a duck with a white beak!” This relative of the Moorhens/Gallinules, is the American Coot. He, too, is characterized by a rather ‘stubby’ bill that extends into a frontal shield, in this case white, not red. 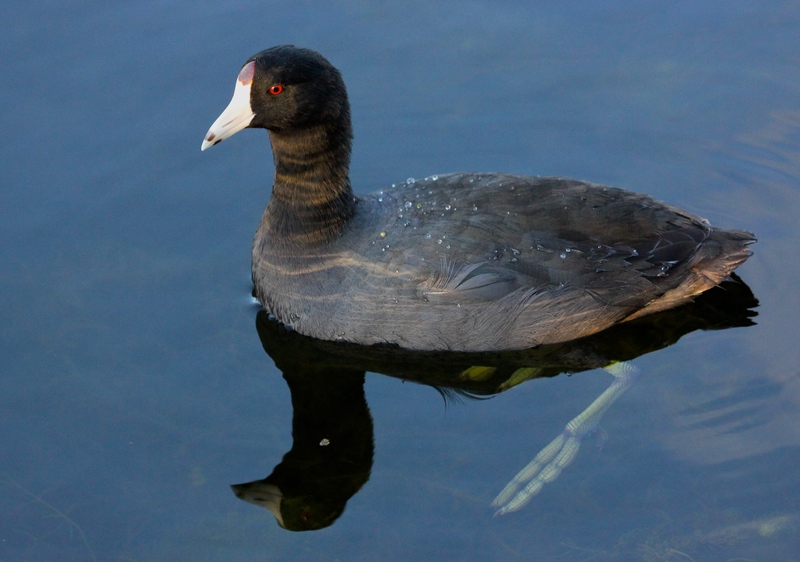 The red-eyed Coot also has unique, feet – his are large, greenish, and lobed. 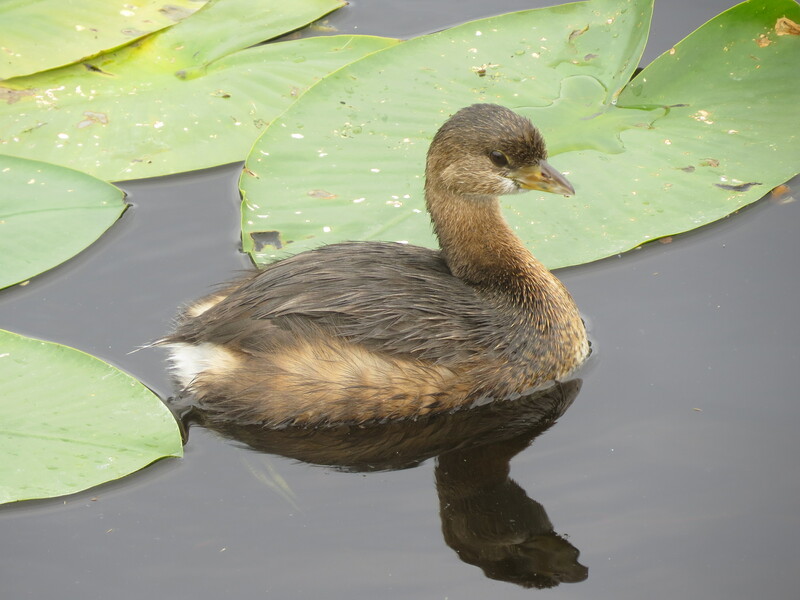 This bird is also thought by many passers-by to be a cute little duck, but he is a member of the Grebe family. The Pie-billed Grebe swims busily about, then suddenly dives completely underwater, only to pop up to the surface a few yards away. All About Birds calls the Pie-billed Grebe “part bird, part submarine,” a very apt description, as they “…can trap water in their feathers, giving them great control over their buoyancy.” They are much better suited to be in the water than in the air, and are not very good fliers. A close relative of the Common Moorhen is the Purple Gallinule. He is often seen walking along the waters’ edge, or clambering high up on the slender Fireflag branches, so his gigantic chicken feet are quite obvious. Purple Gallinules are very striking in appearance with their iridescent blue-green-purple feathers. 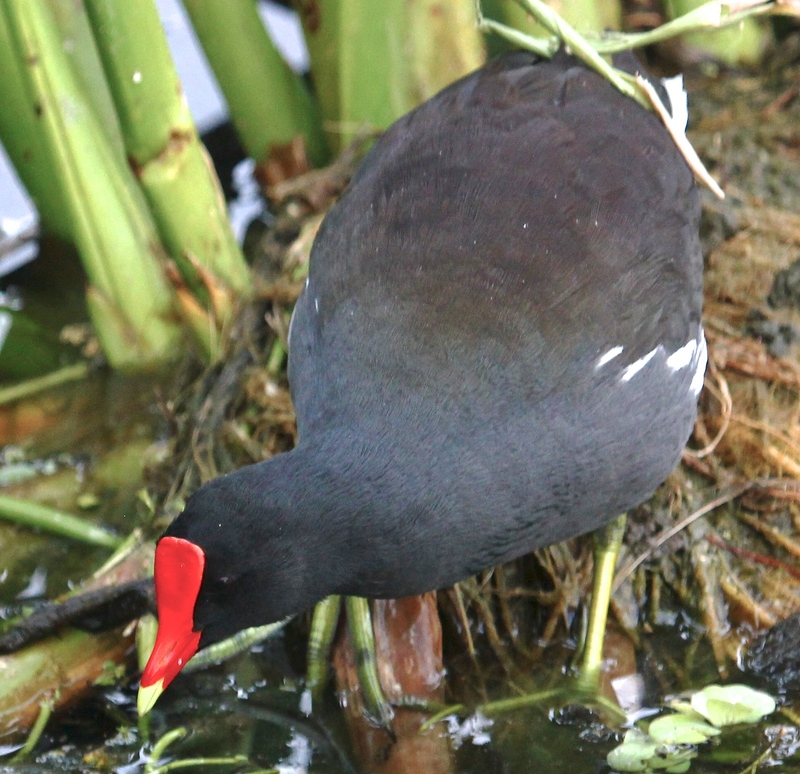 Their bright red and yellow beaks are similar to the Moorhen’s, but have a very distinctive powder blue frontal shield. There is one last bird to add to this collection who may not be mistaken for a duck, but is certainly often mistaken for a Purple Gallinule! 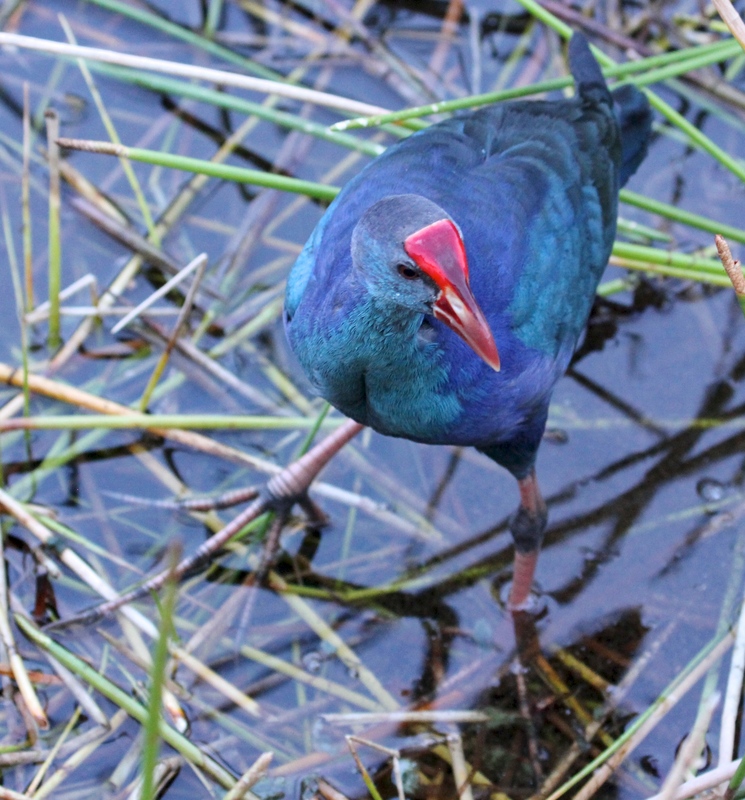 The Purple Swamphen, a non-native, has been quite visible recently, nesting in our wetlands. People often think this is a Purple Gallinule. But the Purple Swamphen is much bulkier, his beak coloring is different, and he uses his long pink feet and toes to pull up the vegetation, leaving quite a mess for the native birds. This entry was posted in Birds, Marsh/Wetlands and tagged American Coot, Common Gallinule, Marsh Rabbit, Pie-billed Grebe, Purple Gallinule, Purple Swamphen. Bookmark the permalink. Cute little marsh rabbit. Love the colorful Gallinule. Thanks Pat. 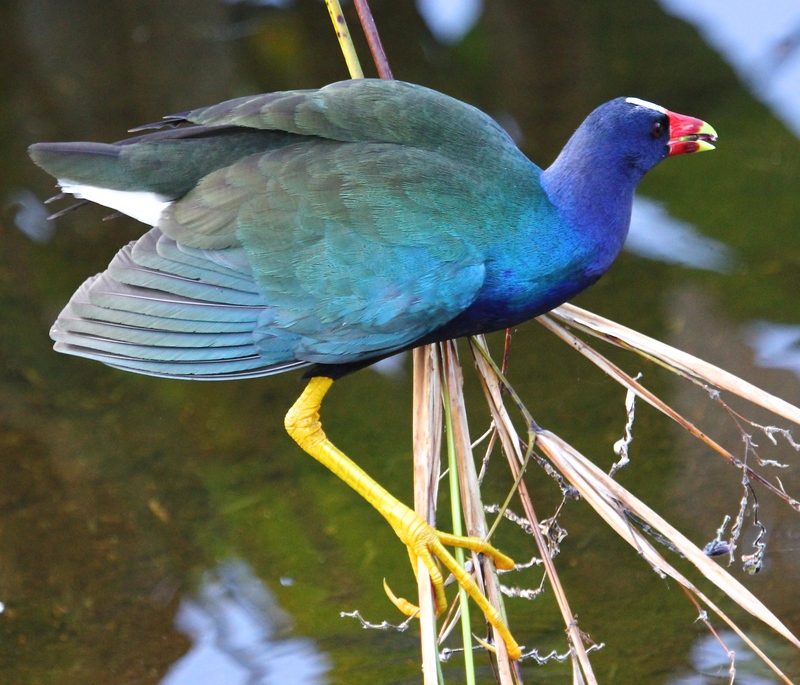 I must highlight more Purple Gallinules – they are just marvelous! Common Moorhen and the Purple Gallinule are new birds to me. Wonderful photos of them. I just photographed the red-eyed coot and they have the strangest looking feet. I watched them feeding too and they are an odd little bird. I can imagine you have a great time watching the birds in your area and seeing things uncommon to other birds. Up here, I guess for where birds migrate to and from, they have developed certain adaptations for those habitats, but the coot’s feet don’t make as much sense to me. Also, if you know why a long-tailed duck has that almost useless looking tail, let me know. I tried to find out. I doubt you would ever see one there since they are arctic sea birds, but you seem to know a lot about many birds. Good question about that long-tailed duck, Donna, but I really am not familiar with it – sounds interesting! All very similar water fowl to ours in Australia, but with different names. Compare our Dusky Moorhen, Eurasian Coot and Australasian Grebe. We have the Purple Swamphen also. Thanks for sharing. I enjoy your blogs as I am learning much about your birds. Thanks for all these specific names, AussieBirder – I will definitely look them up. I also enjoy seeing the similarities and differences in birds around the world – fascinating~! I just photographed the Common Moorhen and the American Coot swimming together on the pond beside our house in Florida. It was not a good photo because they were too far away but your photos and information were most helpful to identify these two water birds. I was intrigued that they were so comfortable feeding together in the afternoon sun. Glad to be of help 😉 Love to watch those guys! We recently saw literally hundreds of Coots in groups recently at Merritt Island NWR. Hello Dena, thank you for asking. Could you tell me more about your organization, which photo you’re referring to, and for what purpose it would be used?